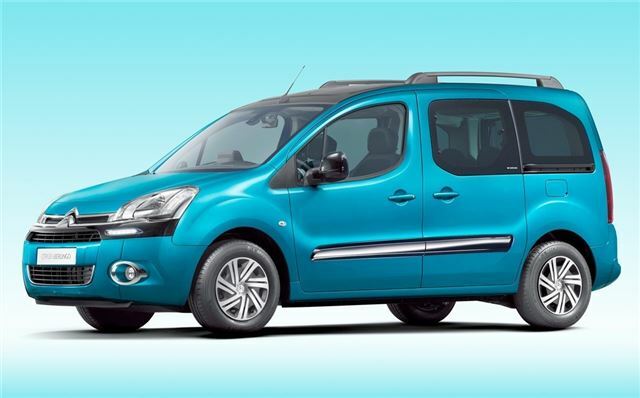 The Berlingo Multispace gets a wider, grille, an updated chevron badge and new headlights. The lower part of the grille can be fitted with cornering lights integrated with the fog lights and LED daytime running lights. There are also new Airflow wheel trims to help improve fuel and efficiency. A Black Pack is available, with Onyx Black trim on the top of the front bumper, side mirrors, side rubbing strips and rear number plate moulding. Inside, the colours and materials have been revised on all models plus there are two new paint colours - Nocciola and Belle Ile Blue. The engine range remains unchanged with the Berlingo Multispace available with the e-HDi engine with Stop & Start and a six-speed automated manual gearbox - e-HDi 90 Airdream EGS6 versions emit 125g/km of CO2. On five-seat versions, the HDi 75 and HDi 90 models now emit less CO2 - 135g/km down from 139g/km. The HDi 110 engine is upgraded to HDi 115, providing extra performance. The revised Berlingo Multispace is available in three trim levels, VT, VTR and XTR. The XTR versions get raised suspension, a skid plate beneath the car and a special body pack. Meanwhile, the nine-seat Dispatch Combi gets a new front end and comes in a new paint colour called Hickory Brown. Grip Control is now available and has of four modes - normal, all-terrain, snow or sand. This anti-skid option optimises traction and adapts to different driving situations. The Dispatch Combi is also now available with a six-speed automatic gearbox, which is mated to the HDi 160 engine. Six-speed manual gearboxes are also available with the HDi 95, HDi 125 and HDi 160 engines. The new Dispatch Combi is available in two trim levels in the UK, Combi and Combi SX.